Although it’s taken a little longer than we would have liked for the fall weather to arrive, we’ve finally seen a bit of a break from the endless 100 degree days that summertime brings to Virginia. If you’ve been following our family for a while now, you know that we spend as much time as possible on outdoor adventuring. Lucky for us, we live on the corner of a huge park with lots of trails for exploring. The boys are growing up SO fast right now and we’re finding a whole new world of outdoor activities we can do as a family now that we don’t have diapers and strollers to worry about! The last couple of months we’ve spent lots of quality time together biking around the neighborhood. I can’t even express to you how much fun it’s been for all of us…but especially me! The boys of the house (including my husband) have all had bikes to ride around in the past, but for one reason or another I didn’t have one. This fall we changed that so we could all go out and cruise around as a family. Our littlest grew a lot this year so he also got a bike upgrade which he was thrilled about. The bikes we’ve been enjoying are made by Kent Bikes and we’ve been LOVING them! You may have seen a couple of peeks at my sweet new ride on my Instagram page, but I wanted to share some more photos and information here! When I was deciding on a bike for myself, I knew I needed something versatile since we live at the beach but often enjoy woodsy trails as well. 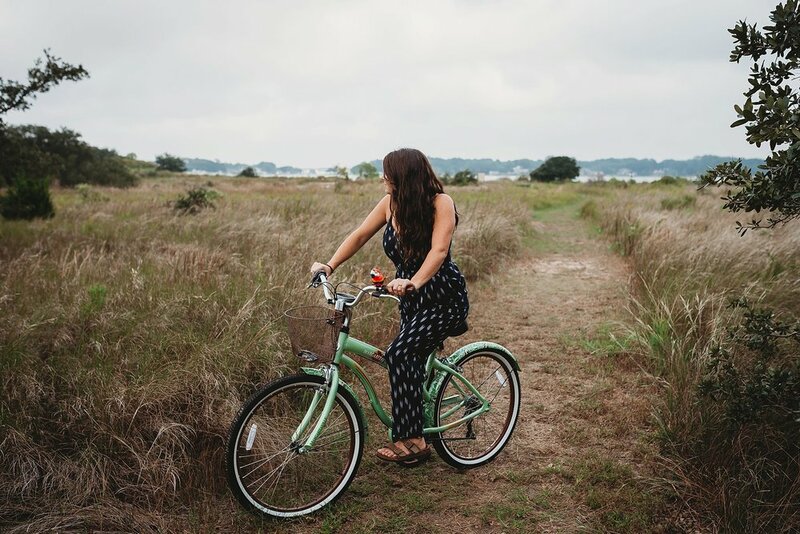 I wanted something like a beach cruiser to fit in with everyone else in our coastal neighborhood, but I needed something a little more than just a regular beach cruiser because we spend a lot of time at our state and city parks. 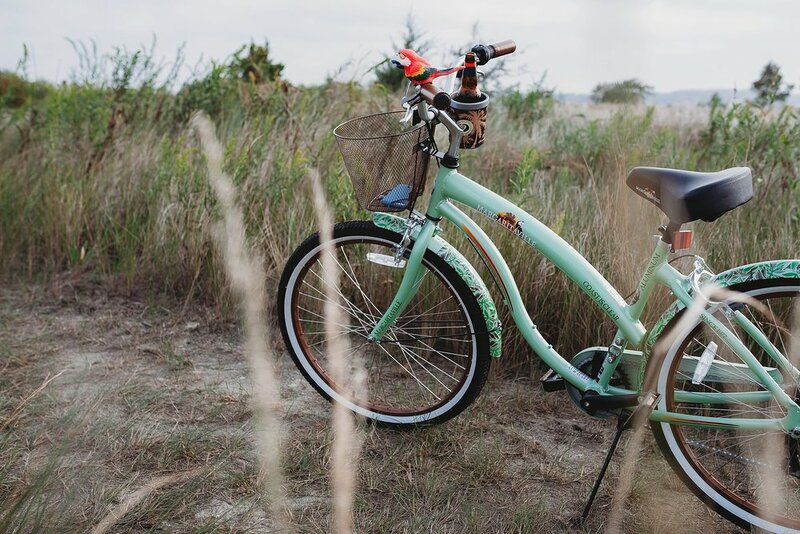 When I spotted this Margaritaville Coast is Clear 7 Speed Cruiser, I knew it was the perfect fit for my needs! It has that fun beachy look I was dreaming about AND is a 7 speed so I can use it on trails in addition to on the boardwalk. A basket and cup holder were also on the wish list so I can carry around the necessities like a cell phone, wallet, keys, and water, coffee, or beer (depending on the time of day), as well as the sticks, rocks, and shells the boys find and just have to take home with us. I got all of the features on my wish list…but MORE! What I didn’t think about prior to getting the bike but now realize their importance are a large, comfy seat, squishy handlebar grips, and …drum roll please…a bottle opener! Woohoo! I honestly couldn’t have come up with a more perfect model for my needs if I had created and customized a bike myself. As for the little guy’s bike, we decided on an obvious choice because, well, he’s a daredevil and loves an adrenaline rush. Both of my boys watch their favorite BMX riders on the Red Bull Channel religiously, so clearly he wanted his own BMX style bike. This 16” Razor DSX made by Kent Bikes was the perfect fit! He’s 4 years old but has been riding a two-wheeled bike since he was 3, so we took the training wheels off and he sped away as fast as he could. The bike has a dual suspension frame, front hand and rear coaster brakes, and amazing tire treads. I’ll be honest, he’s been begging me to bring him to the skate park so he can take it off the jumps and down the ramps…but I’m still a little traumatized from the time I took them there to use their Razor scooters and all the teenagers racing around almost killed them! haha! Both boys actually have BMX style Kent bikes right now and I’ve promised them that at some point we’ll make our way back to the skate park. But until then, we’re sticking to the streets, trails, and parks! So far we’ve used the bikes on dirt, pavement, sand, and grass - and we’ve had absolutely no problems on any of those very different terrains. With the boys ages right now (4 & 7), biking and stand up paddle boarding are our two favorite things to do as a family. Since our paddle boarding time is getting more limited by the day right now, I know we’ll be spending hours and hours riding bikes through the fall and winter. It’s been such an amazing way to disconnect from technology, bond as a family, and get exercise all at once. My youngest doesn’t have school on Mondays so it’s his day to pick which activities he wants to do one-on-one with Mommy, and he always picks a bike ride as our first activity of the day. While we’re crusing around, I’ll hear comments like, “I’m having so much fun with you, Mommy” and “Mommy, I love you” because he’s so thankful for the quality time we have together. It melts my heart and will never get old.